Novice 8 and 2V8 boats crush cross-town rivals in Mission Bay. 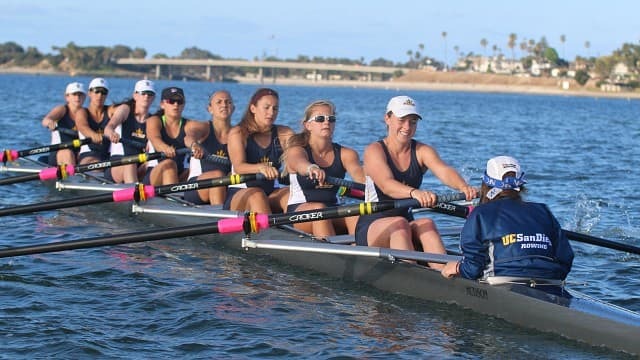 On Friday morning, the women’s crew team raced against rival San Diego State at Mission Bay. Winning two of the five races, the Tritons saw the matchups as preparation for the Western Intercollegiate Rowing Association Championships next week. In the Novice-8 race, the crew of coxswain freshman Allison Kubo, junior Rachel Becker, freshman Erika Assoun, sophomore Jaida Aikens, freshman Angela Lee, junior Helen Femmel, senior Aleksandra Boychenko, senior Annahita Haghighi and freshman Katie Potts defeated the Aztecs, posting a time of 6:56.1 seconds to SDSU’s 7:18.0. The Tritons also won the 2V8 race, with coxswain freshman Tori Wong, junior Shruti Kamath, freshman Janell Ingersoll, senior Emma Purcell, senior Natalia Royal, sophomore Carolyn Montellato, senior Christina Nilles, senior Nicole Arkosy and freshman Juliane Smith besting SDSU by almost three seconds with a time of 6:44.1. In the Varsity-8 race, the boat with coxswain senior Catherine Sheffler, senior Kelly Peterson, freshman Jessica Levesque, freshman Catherine Mosher, junior Nicole Hammonds, sophomore Amber Harris, sophomore Jordan Levy, freshman Olivia Koyama and junior Madison Kohlenberger was edged out by the Aztecs 6:34.6 to 6:35.8. SDSU dominated the Varsity-4 race, however, defeating the Triton boat of coxswain freshman Juliana Burns, senior Kimberly McCune, sophomore Lauren Iannetta, sophomore Jennifer Dutton and senior Claire Duesdieker by 7:13.1 to 7:41.0. Finally, in the 2V4 race, SDSU “A” and “B” boats defeated the UCSD crew of coxswain junior Sara Leontis, junior Courtney Breslow, junior Lauren Van De Hey, freshman Annie Hocking and senior Michaela Kazek, which finished in 7:47.6. Looking to build on this past weekend’s results, UCSD will compete in the WIRA Championships on April 25 and 26 at Rancho Cordova, California.